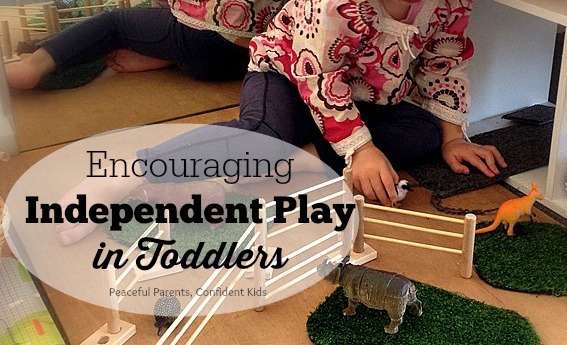 Here are eight tips that have most helped us in encouraging our toddlers to play independently. Much of the need our children have for us to play with them is conditioned by us in the early days and months. In our excitement to play with and for our babies we are inadvertently teaching them that their own play is not good enough. Instead of trusting in the contentedness they often have at that age, we are rattling things at them, playing little games, showing them how things work etc. When we trust that they really don’t need to be entertained as babies because everything is new and exciting to them, then we teach them to be content with their own discoveries. 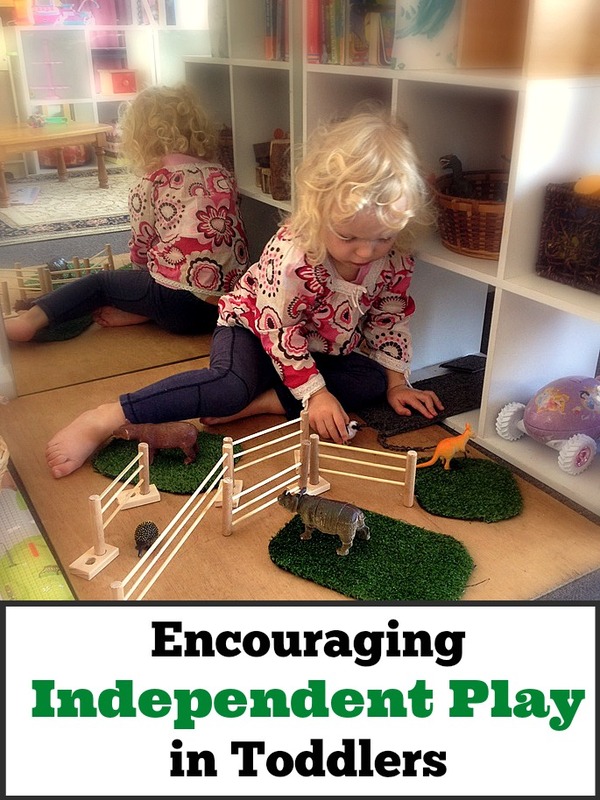 Toys are a huge part of encouraging independent play. Our children are born with not only a huge capacity to learn but to be creative as well. When we expose them to toys which entertain them at a push of a button, the creative part of their brain is not fed and nourished and as such reduces. As the novelty of the flashy toy quickly wears off, we find that children require more and more elaborate toys to achieve the same entertainment factor. Replacing battery operated or single function toys with open ended, problem solving, role playing and age appropriate toys, will encourage children to use their imaginations, leaving them free to control the play. 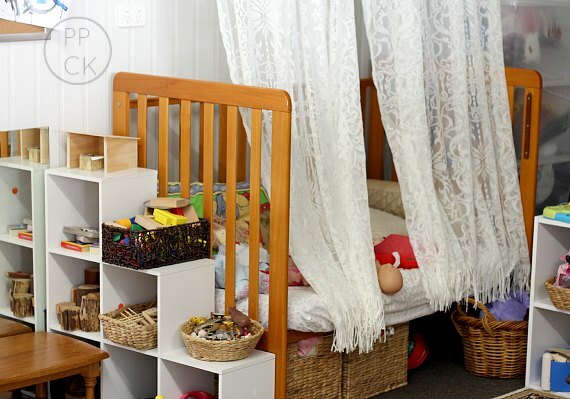 Items such as such as spoons, cups, bowls and balls for babies and blocks, pieces of material, cardboard boxes, play kitchens,dress ups, tea sets and train sets for toddlers are so multidimensional that they leave a child’s imagination free to create and explore. 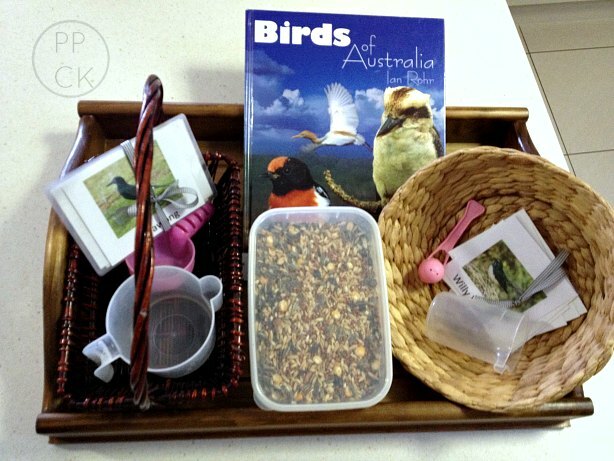 This helps build the child’s confidence in their ability to play and thus allows them to become more independent. The other thing that is perfect for developing babies and toddlers are small climbing structures, especially those that can have multi-purposes like cubbys or small steps etc. Here are some of our favourite open ended and role playing toys along with some climbing structures for babies and toddlers. 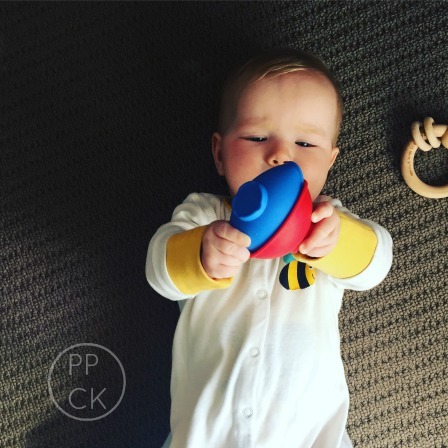 This list contains Amazon Affiliate Links, but bear in mind that the best baby/ toddler toys come straight from the kitchen cupboard. When Magda Gerber conducted studies of children over many decades she concluded that children are highly competent beings capable of doing far more than many gave them credit for. She proposed that given the right environment and provided with adequate love, support and respect, children will naturally thrive, learn, play and grow at the perfect pace for them. She observed that children flourished in play in the presence of their caregivers but actually lost confidence in their ability to play when the play was done for them. That is, they came to consider that their own form of play was not valued when the caregiver took over, made suggestions or controlled the play scene. So it is important to leave the play to the children. This doesn’t mean you can’t be there to enjoy it, it just means that watching and observing is better for encouraging your child’s natural play instincts than actually playing and thinking for them. My children often invite me into their play and I take on a puppet type role. They pull the strings and I cooperate accordingly, trying not to take the play to a level more in line with my development or experiences. When children are playing, it can be easy to trivialise it or not treat it with due respect. 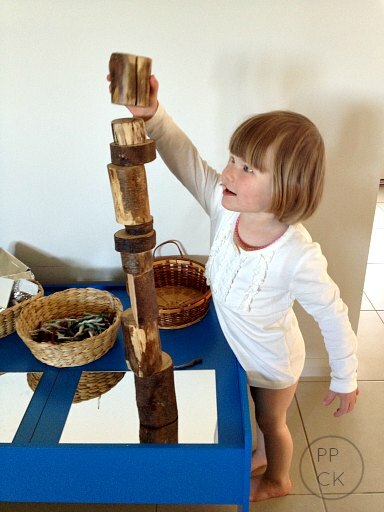 Understanding that a child’s play is their work, respecting that they are engaged and occupied even when it doesn’t look like much and giving them the time and space to do as such encourages children to be intrinsically motivated in their play and thus allows them to be content playing on their own. Avoid unnecessary interruptions to their play. Swooping in to pick up a toddler in the midst of play because we decide it is a meal time, nappy change time or even just time to go, conditions children to become easily distracted and lessens the value they place on independent play. Children want to know that they are valued, that we are genuinely interested in them and what they do. Dedicating some time everyday to sit and watch them play is important to satisfy this need. If they don’t have this need satisfied, they will seek the attention they desire through more overt means and will be less inclined to want to play independently. Observations should be fully attentive with no phones, no computers, no magazines etc. I can’t stress the value of this for our children.Try to dedicate 20 minutes to half an hour of quality observation time every morning with your This will not only fill that attention bucket and reinforce the value you place on their playtime, you will find that you learn a lot about your children. You will see their intelligences, their interests, their ideas and their thoughts. It’s amazing how much of our children’s mind sight are revealed through their play. Caregiving tasks are the perfect time to connect with children. Often, when we shower them with our full attention during these times, they are less likely to need us at other times throughout the day. Sing songs with them in the bath (my kids love playing 5 cheeky monkeys with tongs and empty food dye bottles). 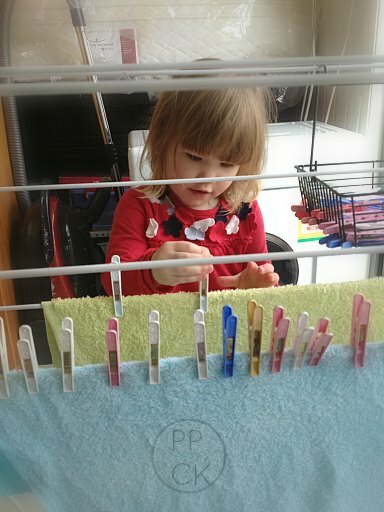 Nappy changes/ getting dressed etc are also perfect times to connect by inviting the child to participate in the change as much as possible. Talk to them and help them participate in theses tasks instead of doing things to them whilst they are distracted with toys, phones or the TV. Have some fun playing peek-a-boo with younger kids or be silly with older kids by having a playful pillow fight or dressing them the wrong way eg (pants on your head). This type of connection can be given at all ages, including newborn, as this beautiful video demonstrates. 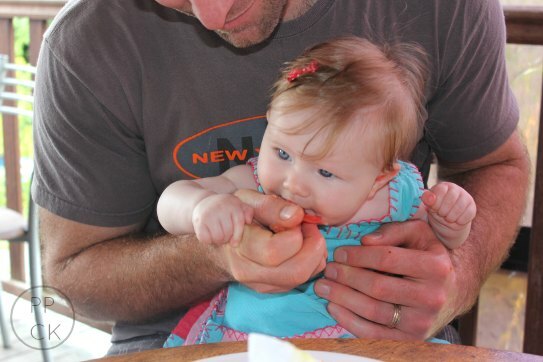 Here’s how we changed our change table relationship early on with our children. When we tune in to the interests of our child and provide them with an environment that is engaging and well-suited to their needs, it can encourage them to play independently. If our children are sensory and enjoy exploring their environment with all senses (like mine do) we can provide them with a variety of play materials that satisfy this and encourage them to explore their interest further. For example, I always have play doh available and I have a box of fabrics of varying textures for my little ones to explore at will. The sandpit has been a welcome addition recently, with my children disappearing into the backyard for extended periods of sandpit play. They have also been really interested in birds lately and spend a lot of time asking about the birds they see in the garden. Giving them some related materials helps them to explore this further and encourages their inquisitive minds at the same time. As they get older and begin questioning the workings of the world, tapping into those questions and genuine interests, providing them with an understanding of how to learn, research and discover more will help them develop the skills they need to do this independently. If we answer their questions straight up, we deny them the opportunity to learn how to discover it for themselves and further increase their dependence on us. Kate, from An Everyday Story provides many wonderful examples of this on her blog. The Lure of screen time is understandable. For many, it is a sure way of achieving some independent and peaceful time away from their young one. The issue in the realm of independent play, though, is that the sensory bombardment and stimulation that screens provide our children can be really hard to compete with. A basket of blocks or some cardboard boxes along with their own imaginations may not seem adequate enough after watching a thrilling episode of Fireman Sam. This habit can be a tough one to break for both children and parents but it can be done if you are thinking this is something that could help your child with their independent play. This article has some great ideas for encouraging less screen time during the day. I love your suggests for toys!!! Great tips!! thank you for sharing! pinned! The astro turf is part of an off-cut from a relative who was laying some on her patio. I know you can go to places like Masters and Bunnings and see whether they have any end pieces, scraps or samples etc.I have cut ours into a variety of shapes and sizes (I had about 1m squared originally) and the children use them in their imaginary play all the time. Yes! Great reading this. Love hearing my kids playing independently, and I find my children becoming deeper in their play (their work) when they can see or know I am deeply in my work (which may be cleaning or gardening or similar). And I think open ended materials makes a huge difference too! 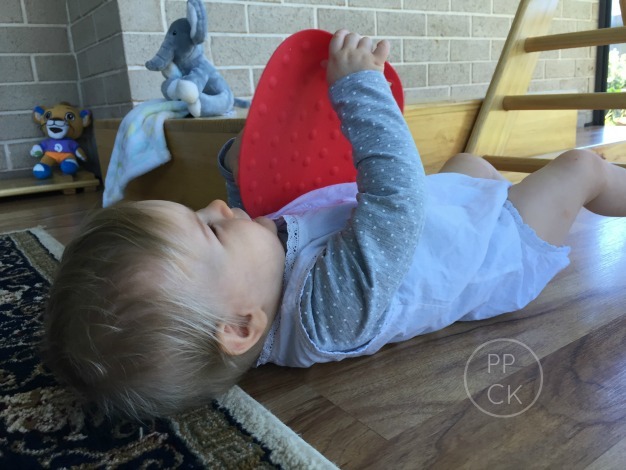 where do I start… Independent play is my goal, and i don’t know what to do for this to happen. More than a year ago, when my daughter was 2 yo, I started RIE implementation and I thought that starting independent play would be a great place to start (with feeling acknowledgement). I started setting the wrong limits (like not picking her up), and went back to square one. is there something that you did to move from this state: “but for the longest time HAD to have us right by her to play and it seemed nearly impossible for her to be happy with her own company for any more than 30 seconds” – to the free play state? 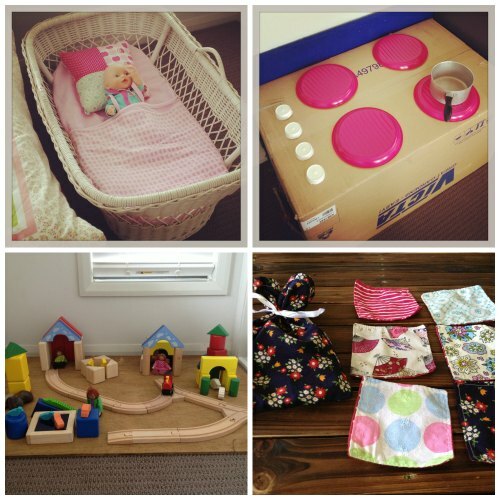 This is really amazing to prepare your child independent,because it helps them a lot, they easily tackle situation alone.I have a 6 months old daughter and I also want to prepare her for independent play. That’s why i want to buy toys like this(mentioned above). Really a huge collection of Toddler Toys. Love this! 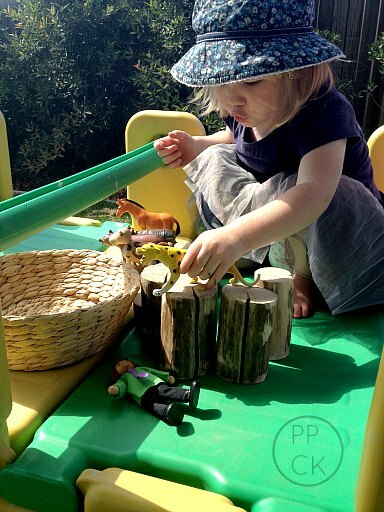 I’m a full-time nanny which means I sometimes feel guilty encouraging independent play. It’s always great to be reminded why independent play is so important for learning and development. I’m not paid just to play with kids, I’m paid to care for and nurture them! Helping them learn to play independently is as much an important part of my job as sitting down to join them. Thanks for the great reminder and practical ideas! My daughter has recently been pulling me over to her table to color. I’ve been a bit befuddled by this–does she want to watch me color, color together, watch her color? Since I’m all about independent play, I didn’t know how to approach this. Last night, I colored a little, but I came to realize that she wanted to demonstrate her ability to color to me. In reading this article today, and stumbling upon #5, I think I know what she’s really looking for! Thank you–I had an “ah ha” moment there! There’s a song ‘5 cheeky monkeys jumping on the bed. One fell off and bumped his head. Mama called the doctor and the doctor said. No more monkeys jumping on the bed’ I would line up the empty bottles and my daughter would bump them off with the tongs and then when they were all bumped off, she would use the tongs to collect them up again. Great article. Some valuable insight.